Backed up by one of the best wireline, cable, and WiFi infrastructures in the world, the U.S. mobile business is a rich marketplace. The top two U.S. mobile operators, AT&T and Verizon, are among the 50 most profitable public companies in the world . Meanwhile, the 3rd and 4th operators, T-Mobile USA and Sprint are getting set to merge to create another giant provider with 126 million subs. But operating way outside the U.S. mobile industry limelight is a pre-paid MVNO who rides on the networks of all these larger operators and has amassed an impressive 26 million subscribers in the same U.S. market. It’s Tracfone Wireless Inc., a subsidiary of Mexico’s largest telecom firm, América Móvil. At the evening cocktail hour of WeDo’s Americas Conference in Fort Lauderdale (FL), I had an insightful conversation with a Tracfone executive who explained some of the key steps his firm is taking to combat fraud — and, in particular, stop cellphone trafficking. Before we look at the company’s fraud controls and enforcement actions, it’s worth spending a few moments to discuss Tracfone’s excellent operating model and commercial success. NET10 Wireless sells Android phones from LG and Samsung, plus unlocked iPhones. Its motto is No Bills, No Contracts, No Evil. A similar brand, Page Plus Cellular, originally operating in Ohio and Michigan, was acquired by Tracfone in 2013. Straight Talk has a joint-venture agreement with Walmart, its exclusive retailer, though service and phones can be bought directly from Straight Talk via its website or by phone. Total Wireless uses the Verizon network and features multi-line “family” plans and is available at national retailers such as Target and Dollar General. SafeLink Wireless serves 4 million free cellphones (with limited monthly voice minutes) to low-income families supported by America’s Universal Service Fund. In 2016, Tracfone acquired two MVNOs from T-Mobile USA: GoSmart Mobile and Walmart Family Mobile. However, Tracfone still operates SIMPLE Mobile as an MVNO for T-Mobile USA’s network with 2.5 million subs. Telcel América is an MVNO brand mainly targeted for Hispanic consumers, primarily Mexican community members living in the USA. From the above discussion, you begin to see how Tracfone’s business acumen and efficiency has allowed it to capture the largest market share by far of independent MVNOs operating in the U.S. And it is especially strong in the retail channel. 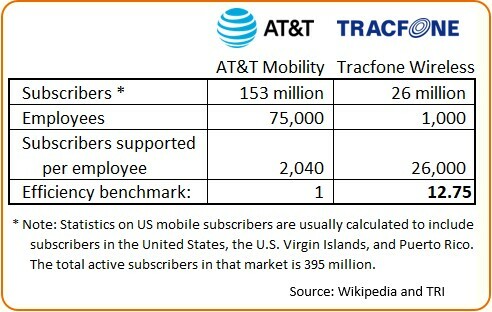 Comparing mobile subscriptions per employee, we estimate Tracfone is almost 13 times more efficient than AT&T Mobility. Now we know AT&T offers a far more expansive product line tailored to higher paying customers. However, considering the myriad of retailer partnering and customer-facing issues Tracfone deals with, its performance is certainly outstanding. In the billing/RA and fraud control area alone, only about 50 people are needed to get the job done. When giant retailers like Walmart and Target depend on your MVNO operation, you need to carefully manage fraud and assurance issues that could easily sink your business with them. No direct international calls — A fraudster cannot auto-program a Tracfone device to pump through calls because a connection requires a two-step process. The customer calls a designated 800 (free) number and follows recorded instructions to initiate calls to the 50-odd countries Tracfone supports. No international roaming is allowed — Though the Tracfone service freely roams inside the U.S. market, international roaming is blocked. And in that way, they avoid the hornet’s nest of billing delays and lack of control experienced in international roaming. What’s more, Tracfone flat-out restricts calls to cellphones in certain countries. Linking Up to 10 International Phone Numbers with the Subscriber — When the customer dials the 800 number, TracFone identifies the customer’s phone and places the call to the associated number. By providing the phone number and serial number of the subscriber’s phone at TracFone.com, a customer can associate up to ten 800 numbers with designated phone numbers outside the U.S. In fact, the customer could place the 800 number in his Contact List as the “phone number” of the relevant person. However, the contact info could not be copied to another phone unless the customer also registered that phone with the called number. Tracfone sells primarily to the consumer market, so restricting speed dialing to 10 authorized foreign phone numbers is a prudent move. Yes, it’s a bit inconvenient for the subscriber, but it takes away huge headaches from fraud losses. Of all the fraud issues Tracfone worries about, perhaps its biggest concern these days is stopping cell phone trafficking. In fact, the company set up a website — StopCellPhoneTrafficking.com — to educate the public and warn would-be criminals of the consequences. Now by “trafficking” we’re not referring to the casual theft of cell phones by small-time thiefs. No, trafficking is organized crime where the objective is haul away dozens, hundreds, or thousands of devices so those phones can be unlocked, reflashed and used on some other wireless network around the world. In the U.S., mobile phones are often heavily subsidized so the retail price the buyer pays for a phone does not reflect its true cost. The provider buries the phone’s cost in its monthly or yearly “phone service” or pre-paid top-up fees, recovering its phone investments over time. The U.S. wireless industry has lost more than $1 billion to cellphone trafficking. Traffickers use armed robbery, burglary, identity theft, and fraudulent schemes to get their hands on cell phones. In fact, an increase in violent street crime associated with theft of cell phones by traffickers is being reported by Law Enforcement agencies worldwide. Organized crime and terrorist groups are often profiting from cellphone trafficking. When unsuspecting customers buy trafficked “new” cell phones (often resold in counterfeit packaging) the phones often don’t work as intended anyway. Also on the website are posted about 30 news stories and 200 court documents showing the action Tracfone and other operators are taking to protect themselves and financially go after the trafficking criminals and bring them to justice. Tracfone’s campaign to weed out cell phone trafficking began in 2006. As of the year 2012 Tracfone had filed 88 lawsuits in 12 different federal district courts across the United States. The litigation resulted in injunctions and final judgments against 205 companies and individuals. In all, Tracfone was awarded more than $305 million in judgments against international traffickers. law enforcement perspective on the cellphone trafficking problem. Whitehall, Pennsylvania -- In 2017, Police apprehended two men who stole 79 devices, mostly phones, worth $40,000 and $400 from the cash register during an armed robbery of the store. Later, Michael Davis, an employee at the store was murdered outside his home, and the store manager was abducted and beaten. Brooklyn, New York — In 2016, police arrested three men and investigators seized more than 11,000 counterfeit Apple and Samsung phones, along with more than $70,000 in cash. The busts were the result of an ongoing investigation into counterfeit cellphone trafficking. Minneapolis, Minnesota: In 2017, three brothers were sentenced to lengthy jail times for operating an organized cell phone and mobile device trafficking operation. Kana (40), Jamal (45), and Nizar (26) Mustafa from 2006 through 2014 obtained $20 million worth of mobile devices, then sold these devices around the country and internationally. Miami, Florida — in 2012 TracFone scored a victory against international traffickers as U.S District Judge Jose E. Martinez entered a permanent injunction against a Hong Kong company to pay $40 million in damages to Tracfone for illegally trafficking its cell phones. Portland, Oregon — In early 2019, two foreign students from China were busted for making $900,000 in fraudulent Apple iPhone returns, according to federal law enforcement. They allegedly sent fake iPhones back to Apple claiming they did not work. When Apple sent a new, legitimate replacement phone, the pair would sell them to a broker — usually overseas. Both students would get a cut of the profit. It seems all of the sales were done online. The cellphones you sell are magnets for fraudsters to hijack. Use 800-numbers and other controls to limit a fraudster's ability to pump IRSF traffic. Violence and thieves are a fact of life. 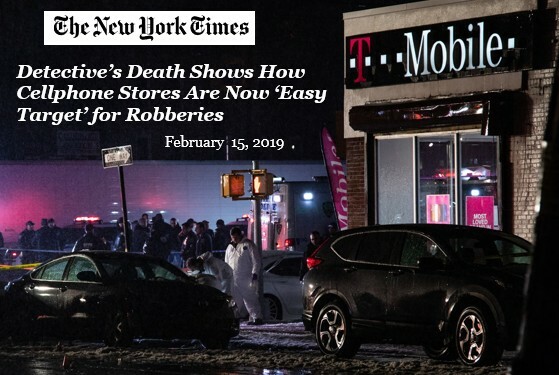 Just as a city can't function without prosecutors and police, a mobile phone business doesn't work without law enforcement. Fraudsters keep track of which operators go after criminals, so it's best to earn a reputation for hiring lawyers and investigators who send people to jail. Dan Baker is research director of Technology Research Institute (TRI) and editor of the on-line magazines Black Swan Telecom Journal, Top Operator, and FraudTech Journal. Big Data without the Database: SIGOS Delivers Purpose-Built Analytics for Mobile Money, Fraud Control & Assurance — interview with Kenneth Mouton — A strategic look at the innovative SIGOS Analytics managed service that leverages purpose-built solutions across many fraud/RA cases such as SIM Box Fraud, Reporting, and Mobile Money. Tracfone’s Anti-Fraud Controls and Law Enforcement Actions to Stop Cell Phone Trafficking — by Dan Baker — A conversation with an executive at Tracfone Wireless leads to lessons on MVNO fraud control and the significant law enforcement steps Tracfone is taking to stop cellphone trafficking, curb the violent of organized crime, and bring people to justice. Deep Fraud Investigations: Mavenir and the Role of Machine Learning in IRSF Control — interview with Ilia Abramov & Marie Casey — Machine Learning-based fraud protection promises an answer to blocking fraud with precision, especially in roaming and nextgen mobile networks. An ML champion discusses unusual and interesting fraud schemes uncovered by deep investigations. Why SIM Box Bypass Fraud is a Growing Concern in A2P SMS, Especially on the Roaming Side — interview with Philippe Orsini — ASP SMS traffic is a big money maker for operators, but fraudulent routing remains a big issue. Learn about the highly complex scheme fraudsters use to exploit Europe’s popular roam-like-home tariffs to bypass SMS aggregators and spike up interconnect costs. Dynamic Reference Data: How Symmetry Helps O2 UK Simplify its Processes, Reduce Errors, and Keep its Businesses in Synch — interview with Nev Phillips & Luke Taylor — How a master data system can enable an a operator to exploit its reference data to: 1) update linchpin data across the enterprise; 2) simplify complex enterprise processes; and 3) get quick answers to assurance and marketing questions. Safety in Numbers and NRTRDE: Syniverse’s Strategy to Constantly Enrich Its Mobile Fraud Intelligence — interview with James Stewart — A discussion on NRTRDE, the Near Real Time Roaming Data Exchange, the complexity of the roaming settlement process, and the fraud challenges mobile operators face as their subscribers roam. Araxxe on the Art of Deception and Analysis in SIM Box Fraud Warfare — interview with Philippe Orsini — A temporary call-forwarding method of foiling SIM Box fraudster attempts to detect test calls via a white list. Also discussed: how wholesale pricing trends can measure the pulse of SIM Box fraud activity in a market. TELUS Analytics Users Get Productivity Boost from Internal Team of Data Access & Showcasing Experts-for-Hire — interview with Mange Kumarasamy — How a large organization with hundreds of analytics users gets help from an internal Big Data team who sources multiple back-end databases; builds tailored reports; and drives campaigns that answer strategic questions for users. Oculeus Launches IRSF Fraud Defense-in-Depth for Enterprises; Cloud Service Screens & Blocks Calls at PBX — interview with Arnd Baranowski — A revolutionary IRSF fraud service stops and blocks fraud at the enterprise PBX. The story explains the service’s SIP signaling, global PBX registration, security, and plans for telecoms to offer the service to their enterprise customers. Subex Juggles a Wide Variety of Business Assurance and Big Data Analytics Use Cases — interview with Rohit Maheshwari — A expert in business assurance solutions explains top use cases such as: IoT security, big data analytics/AI, network asset optimization, multi-player gaming assurance, onboarding mobile subs, and AI customer analytics. MTN Agility: Mastering Exponential Technologies in Revenue/Fraud Assurance and Beyond — interview with Danie Maritz & Tony Sani & Luke Taylor — An in-depth look at RAFM operations and innovation at the MTN Group. Topics discussed include RA/fraud control challenges, strategies, and MTN’s journey to exploit exponential tech (AI, robotics, and ML) in its RAFM program and support of internal non-telco businesses. SS7-Savvy LATRO Teams Up with Law Enforcement to Seize SIM Boxes; Expands into RA Managed Services — interview with Don Reinhart — An expert in SIM Box bypass fraud control explains the value of signaling in pre-call detection of bypass fraud. Also discussed are: the geo-location of SIM boxes; teaming with regulators and police to seize equipment and make arrests; RAFM managed services; and ID problems in the world of IoT. Art of the Fugue: Bringing the Baroque World of Telecom Reference Data to Fraud Management — interview with Guy Howie — A tutorial on the role of telecom reference data in billing, revenue assurance, and pricing analysis. The interview includes details on four new reference databases in fraud control. Share, Educate & Tighten Controls: How to Instill a Strong Telecom Risk & Anti-Fraud Culture — interview with Luke Taylor — Learn the steps operators should take to: educate staff/customers in fraud prevention and assure against mobile service abuse. The interview also dives deep into risk issues that affect the African continent. How IRSF Predators are Evolving their Fraud Attacks on the Weak and Unprotected of the Telecom Serengeti — interview with Colin Yates — Fraud fighter Colin Yates shares some startling research data and facts on how fraudsters are using automation and other techniques get around the recent success operators have had in blocking fraud, particularly to high-revenue destinations.